Well, with Ballet Austin’s Nutcracker gracing our stage until Christmas, there doesn’t seem to be a whole lot of off-stage information to share. 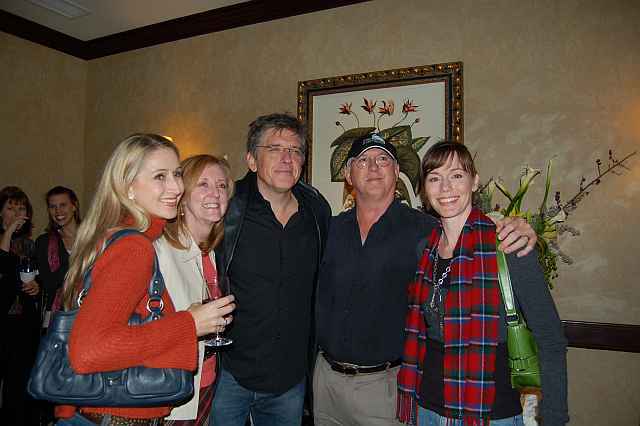 But I did finally get pictures from the evening with Craig Ferguson. 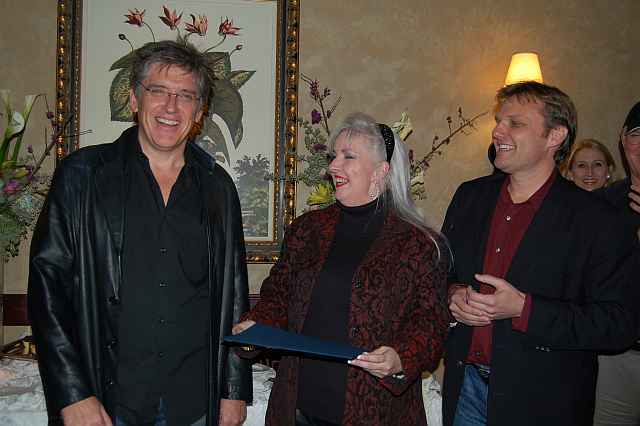 Above left, is a picture of Craig receiving his certificate of Honorary Austin Citizenship from Arts Commissioner Kathleen Harman, which Craig left behind and still doesn’t appear on his on-line list of cities (maybe due to writers strike?). Above center is Craig with our blog winner Marsha McNeese and her guests. 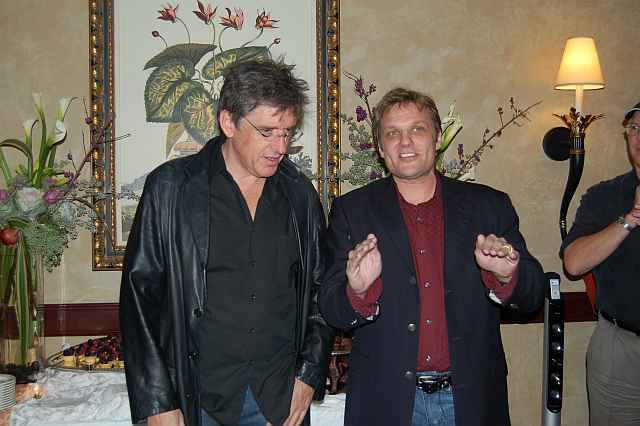 And finally there is a picture of me boring the hell out of our guest of honor. When Craig was given his Honorary Citizenship, he didn’t believe that our Mayor’s name really is Will Wynn and he was equally amused by Council-member Brewster McCracken’s name. While Craig’s show was a blast, I am amazed that someone traveled over 1,000 miles to see him. But then again, he seems to have a lot of fans who are crazy about him. I am sitting here trying to think if there is a celebrity out there like that for me… someone I would drive 1,000 miles to see… hmmmmm… no. 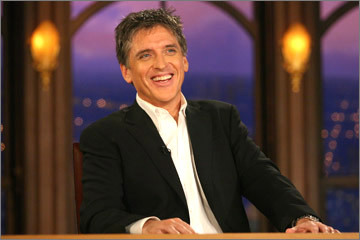 Craig Ferguson seems likes a nice enough guy. Backstage he asked for hair gel and a toothbrush. How’s that for normal? His stand-up is a bit more naughty than his TV show -OK, quite a bit more – but for the most part everyone seemed to really enjoy themselves. 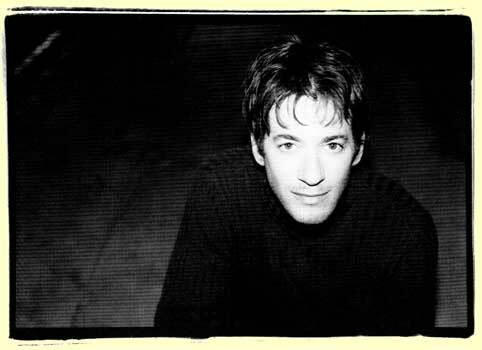 I was backstage talking to RandyKagan (looks nothing like his photo above) who writes for Craig and who opened the show tonight. I didn’t know if Randy wanted me to introduce him or if I needed to say anything special when I did my curtain speech. I had been chatting with him for a few minutes when the tall guy next to him said, “Hi. I’m Craig. Nice to meet you.” I had know idea. He’s like Clark Kent – he had on a pair of glasses and suddenly the celebrity is gone. So after the show, a funny little thing happened. A photographer wanted to get a picture with Craig, Randy and me. Craig told me to stand in the middle. I did the natural thing which was to put my arms out like we were sort of in a huddle for the picture, but as I put my arm behind Craig, a wind caught his jacket (a really nice leather one by the way) and blew it out away fromhis body for a mintue. When the jacket fell back into place my hand was on the inside in a rather too familiar way. So suddenly I am trying to explain why my hand is sort of closer to his skin than it really should be and all the time the photographer is taking pictures and I am not completely sure but I think there might be a rather embarrassing photo. If so, I’ll post it and other photos from the evening when I get them. But anyway, back to Craig being a normal guy. Before he and Randy headed off to explore the bar at the Stephen F. Austin, we chatted for a minute about our children. I have a six year old daughter, Craig has a six year old son and Randy has a five year old daughter. We shared a non-celebrity moment. For a few mintues we were just three dads talking about our kids. Then I think they left to go find some hookers… or maybe they just went for a drink… who knows? I headed home to go to bed. OK. So I have a Board of Directors meeting tonight at 5:00 so I won’t be able to post the winning bid until after 7PM. But don’t worry, all comments are timed stamped so I will know which is the highest bid at 5PM. To bid leave the amount in a comment. The winner will be contacted via email. 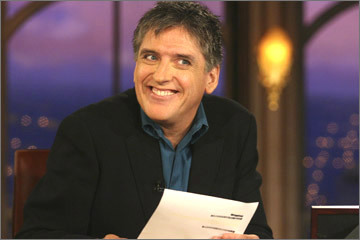 You are bidding on 4 front row seats to Craig Ferguson’s show Friday night at the Paramount… free drinks… free parking… and a private reception after the show to meet Craig. The current high bid is $1,000. Good luck! Wednesday at 5 will the bid still be at $1,000? Chris, my man. What about the free drinks…the free parking… and the post show reception??? Marsha, I love you and your $1,000 bid, but this was just beginng to get good! Maybe this will be like EBay where someone swoops in at the last second and bids it up… you gotta hate that unless you are the seller! And in this case, the seller is the Paramount Theatre which needs a new roof! Do I hear $1,250????? To bid, just leave an amount as a comment. I will capture your email when you do and will contact you if you are the high bidder. The auction closes at 5PM on Wednesday. The tickets are valued at $180 so anything above that is a donation. You are bidding on 4 front row seats and all the benefits that I listed for Chris above. He has recently started to try to get an Honorary Citizenship from every State in America. So far, he has received honorary citizen status from; Arkansas, North Dakota, Tennessee, South Carolina, South Dakota, Nevada, Alaska, Texas, Wyoming, Pennsylvania, and honorary Indiana Hoosier, and various towns in the US. He has as well been named “The Honorary Celebrity of South Dakota”! An 11 year old girl who watches the show emailed the governor of Pennsylvania asking for Ferguson to get citizenship in her state and it succeeded. As is noted by the segment intro graphic on the show, “Honorary citizenship is legally meaningless.” Ferguson was also named a “Duke of Hazard, KY” along with receiving a key to the city. On September 17, 2007, Oscar the Grouch appeared on The Late Late Show and appointed Craig an Honorary Citizen of Sesame Street. There are no plans to make Craig Ferguson a citizen at this time, Portland does not have an established tradition for offering this honor. If we did, our inclination would be to award the honor based on social and humanitarian accomplishments, rather than the privilege of hosting a television show. Craig then used multiple profanities when referring to Mayor Tom Potter which had to be bleeped. Later in the show, when adjusting his map showing where he has been made an honorary citizen, he placed a photo of Michael Moore’s head on top of Portland. 1. If you donate your tickets back, the theatre credits you with a donation in the amount of the tickets original price, and then we open those seats back up for sale. If you ever are not able to make a show, this is an excellent way to help the theatre. Also, check our homepage frequently during the week leading up to a show. We post premium tickets that get returned there. Often times, sponsors and event the artists give back unused tickets last minute. 2. The reception is by invitation only to sponsors (KEYE for this show) and members of our Century Club who are attending the show. Century Club members make a minimum donation of $10,000 that is used, in part, for historic preservation purposes to get ready for our 100th anniversary in 2015. Our goal is to identify 100 members each year between now and then so that eventually an endowment exists to permanently protect the Paramount. The sponsors and CC members alone have taken us to our maximum invitations for this show, but due to the LLS issues I extended one more invitation for the four people who come to the show as a result of this auction. I really can’t open up anymore invitations as there would be no way to fairly decide when to cut them off again. Sorry about that….unless you want to join the Century Club which you can do by clicking here to learn more. 3. Craig has a campaign to get honorary citizenship from as many cities as possible. I do not know what Governor Perry has done, but a representative from the City of Austin is presenting Craig with honorary citizenship at the reception (yikes, one more invitation). 4. Finally, I realize that these auctions quickly get to a level that prevents many from bidding. I want to point out, however, that the Paramount has a mission to make our shows available to a wide and diverse audience. To honor that, tickets to this show started as low as $25 as part of our introductory subscription rate. When shows are “age appropriate”, we also give away tickets to local non-profits working with disadvantaged youths. Often those kids get private receptions as well. That effort is called our Skinny’s Gallery program named after Skinny Pryor. You can donate to Skinny’s Gallery by clicking here. Oh, and sometimes members of our Century Club donate additional gifts so that we can offer these non-profits food as well as transportation to and from the show. Over 2,000 kids benefit each year. To bid simply leave a comment. I will update the high bid each day. The winning bid must be confirmed before tickets are issued. The market value of the tickets is $180 so anything above that is considered a tax deductible donation and will go towards ongoing preservation and community outreach for the theatres. Bidding closes at 5PM on Wednesday. Comments now closed on this post. To bid, please go to most recent post. $600… Do you want to meet him? Chris! Can you feel the love all the way from Milwaukee? I am out here (up here) for a meeting of the National Trust for Historic Preservation and the Leauge of Historic American Theatres… of which the Paramount is one. Oh and for the beer too. Thanks for the $600 bid. Comments now closed on this post. To bid, please go to the most recent post.